* When I cook the bacon, I lay it out on a parchment lined baking sheet. Then, sprinkle the thinly sliced onions over it. I bake it at 350 degrees for 25 minutes or so, until the bacon is crisp. Finally I remove the onions off the bacon and set them aside, and I transfer the bacon to paper towels to absorb the bacon grease. Do reserve the bacon fat (there shouldn't be more than a few tablespoons) for the dressing. The onions get that smokey flavor and are so pungent in the salad. It's a salad, so it's pretty self explanatory- just toss the ingredients with the dressing and chow. Salads are so rewarding! In a blender, combine the first 6 ingredients and puree. While blender is running, and in a slow and steady stream (emulsification) add the oil and bacon fat, until gone and dressing has thickened. Then pulse int he poppy seeds. Now, I am not one to complain about the seasons we have here in this beautiful state, but snow? Really? I blame Eyjafjallajokull. Outside my kitchen window, I have this beautiful little family of blackbirds. They were not amused either. These two babies were complaining to me. My trees were lying on the ground and my irises were gasping. On the positive side, I have yet to get my tomato plants into the ground. So how about a recipe? So, this one is a goodie! My grandma Charlene made the best peanut butter sandwiches ever. She would always butter the bread first, then spread creamy peanut butter on one slice, and home made jam on the other. Soooo yummy. 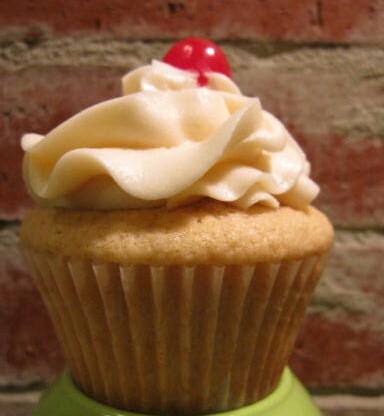 This cupcake is inspired by that sandwich. 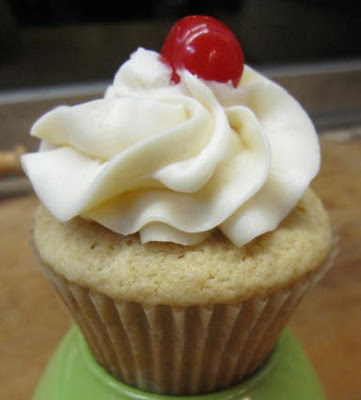 First you start with a moist, rich peanut butter cupcake...fill it with jam....and top it with butter cream frosting....need I say more? Enjoy! Preheat the oven to 350 degrees. With the paddle attachment, beat the butter and sugar together until light. Add the peanut butter and then the eggs one at a time. Add the vanilla and sour cream and beat until smooth. Finally, sift the dry ingredients directly into the bowl and mix well on a low-medium speed. Spoon the batter into muffin tins lined with paper. Bake for 10-23 minutes. Cool on a rack. Spoon the jam into a pastry bag. When cupcakes are room temperature, push the tip of the bag into the center of the cupcake and fill. Frost with the butter cream frosting. With a mixer, combine 1 cup of sugar with the butter and beat until very smooth. Next add the rest of the sugar and beat until smooth. Finally, add the vanilla and cream and beat on medium speed for two minutes or so. *If you need to add more cream feel free to do so. Barbecue: It's not my skill, it's my SUPERPOWER! Yesterday was 80 degrees....it was a fabulous day that whispered summer. Only whispered, because today it is only going to be in the low 60's and it will rain for the next couple of days. When the weather starts to warm up so much, the air outside doesn't just smell like clipped grass and flowers, but, the unmistakable smell of barbecue fills the air. So I thought I might give you some grilling tips and a fabulous BBQ sauce recipe. Barbecue sauce might just be one of the most mis understood items used in grilling. Tomatoes and sugar, which are the base of most sauces, both have low burning temperatures. I get annoyed, when I go to my favorite meat market, and they have pork ribs soaking in barbecue sauce, for customers to purchase and grill. A lot of people, might believe these are grill ready, and that the sauce may make the meat moist and tender. Unfortunately, a crust of tomatoes and sugar get charred on the meat, and the meat dried out or gets tough. A lot of people lose their BBQ mojo by using this technique. Those ribs should only be slow cooked at a low temperature if you want to marinate them in sauce. The deal is, you should baste the meat, just before removing from the grill for 15-20 minutes and while the temperature is reduced. This sets up a nice tender surface and prevents the sauce from being burned. If you feel that the meat needs a deeper and more intense flavor, you might want to apply a rub before grilling. In the near future, I will offer up more BBQ info as well as recipes for rubs, marinades, and mop sauces. In the meantime, you have got to try this easy sauce. The sugar base is root beer, which also makes a nice, dark sauce. but I need to offer a warning: Once you start making your own BBQ sauce, you will be unable to seriously entertain the idea of purchasing store bought products anymore. It is so easy to make your own, and others will demand that you do! So, good luck and enjoy! Quit looking at My Bundt! I have an insecurity. I feel the need to talk it out with you. Because you love me....right? You don't judge...that's why I like you....just the kind of friend I value. You see, I have made cakes for years. I love to decorate them. I take a lot of pride in the finished product. The problem is, that people come to expect it always. One day I was in charge of bringing a dessert for a family reunion. I brought a bundt cake. It was a lemon bundt with a lemon glaze and tons of fresh blueberries...it was yummy. The problem came from a comment that my mother made....she said..."I'm surprised you brought a bundt cake...you took the easy way out." It was on that day, I quit making bundt cakes for other people. I surely didn't want people to think I was copping out on my dessert responsibilities! But, sometimes the end of a meal calls for simplicity. Bundt cakes are elegant but simple. I love how dense they are. I had a bunch of people coming over for Mother's Day and I wanted to serve a simple dessert...so I made this. It was a big leap. My bundt cake pans were happy to see me again. But I still have to admit I was worried that people might have thought I had lost my baking pizazz. No one said a word..not even mom. So what do you think....lazy or not? I will tell you one thing....It was tasty! Bundt cakes are so nice, because they are easy and don't require frosting. So they are the perfect last minute dessert. Preheat oven to 350 degrees. Prepare a bunt pan with butter and flour. With an electric mixer, beat egg whites until frothy and sprinkle 1/4 cup sugar into it. Whip egg until medium peaks form. Set aside. In a mixing bowl, cream remaining sugar and shortening. Combine the vanilla and milk. Sift dry ingredients into the shortening mixture and mix alternately with the milk. Just mix until well combined, but do not over beat. Fold the egg whites gently into the heavy mixture. Pour into prepared pan. Bake for 25-30 minutes or until cake springs back to the touch. Remove immediately from pan onto a baking rack. I just garnished it with fresh berries and a simple buttercream drizzle. The cake has a nice crust and is so moist inside. I served it with macerated strawberries and fresh whipped cream. Pancakes will do for breakfast...lunch...or dinner. They are the most perfect meal. Do you know what those little brownish-black flecks on the pancakes are...hmmmm? ?.....They are little flecks of bacon...for I cooked the pancakes on the same grill I cooked the bacon! Can you think of anything more divine? Combine dry ingredients in a large bowl. Add the milk and eggs first and whisk. Once incorporated, add the butter and vanilla. Mix well. Pour onto a medium-hot buttered skillet. cook for two minutes or so and flip when bubbles pop. It is so much more attractive. Somehow, meatloaf escaped my little ode to family favorites. I am pretty particular about meatloaf. I never order it in restaurants...even if they say it is world famous. And I never...get ready for this one......I am about to commit some sort of blasphemy.....I never eat a meatloaf sandwich. I know...I know...what is wrong with me? I just have never loved a meatloaf sandwich or cold meatloaf. Please love me anyway. I also don't like over mixed meatloaf...meatloaf that has been in a food processor, a mixer or a food mill. It has to have some texture for me and not have a liverwurst texture. So my recipe requires hand mixing. And last but not least...I eat it with......Ketchup!!!! AAAGH!! Preheat oven to 325 degrees. Foil line a baking sheet or spray a sheet pan with non stick spray. Place the meat in a large bowl and crush the crackers (with your hands) over the meat. Now prepare yourself for the next difficult step......add all the remaining ingredients and combine well (with your hands). Mound the mixture on the pan and form into a loaf. In a small bowl, combine the chili sauce, honey and Worcestershire and whisk together. Slather all over the top of the loaf. Bake for 45 minutes or until juices run clean. Remove from oven and let sit five minutes until slicing to allow the juices to congeal. This will help your meatloaf remain moist as well as cut nicely. in a heavy saucepan, melt the butter and then add the flour. Cook the butter and flour for thirty seconds or so. Slowly whisk in the stock, allowing mixture to bubble as you whisk. Finally, add the milk and whisk until smooth. If gravy is too thick for your liking, thin with a bit more milk. So, I love to know what other people love in their meatloaf, and how they eat it. Do you have to have mashed potatoes with it? Gravy? How about a glass of cold milk? I served mine with green beans and mashed potatoes with country gravy...how comfort food is that?